Truck Distribution Center: Trucks and other vehicles may drip automotive and hydraulic fuels and oils on roadways, parking garages or other areas where trucks travel, or are parked. Rain moves these fluids into stormwater systems, causing harm to the environment, including drinking water. 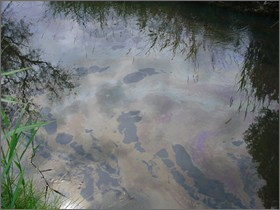 Failure to avoid liquid hydrocarbon spills in stormwater systems can result in substantial fines. A simple solution is to put either a 4 to 10 foot BioBoom that is either 3” or 1 3/4” in diameter into your catch basin. The PRP in the BioBoom will absorb the hydrocarbon on contact and when the temperature is above 40 degrees the microbes that are present will eat both and biodegrade it. PRP is an all natural GREEN product that has absolutely nothing that can harm the environment. If you have a retention pond the BioBoom at the entrance will eliminate the sheen on the pond. Truck stop: Prevent oil leaks from trucks that are in you facility polluting the near by stormwater. By using the BioBoom you reduce you risk of State and local citations. The BioBoom is 100% PRP, nothing added; completely Green. The WellBoom is also 100% PRP: sand is used for buoyant. Steel mills: By using the BioBoom, you can prevent any type of hydrocarbon from entering nearby streams and rivers and causing sheen. If you are using hydraulic equipment in a stream or river bed, it would be beneficial to use a BioBoom around the equipment to prevent a spill the occurred just north of Pittsburgh in the fall of 2008. The sheen from this hydraulic leak caused sheen in the Allegheny River. a NASA Product Hall of Fame. PRP and OilBuster are completely natural and is a 100% Green product.